The proper touch on your piano depends on it being regulated. To many pianists, a piano’s touch is as important as its tone. Touch refers to the efficiency and responsiveness of the mechanical action of the piano, and is what is responsible for giving a piano its full range of power from the silkiest of pianissimos to the crashing double forte. When a piano begins to lose its mechanical efficiency, it is said to have gone out of regulation. Exacting measurements and corresponding adjustments are needed to put a piano back into regulation. The adjustments of your piano action related to touch have not been attended to recently and are causing the piano to be less than responsive. A job of regulation is in order. What exactly would cause a piano to go out of regulation? Weren’t necessary adjustments set at the factory? To a greater or lesser degree your piano would have been regulated at the factory where it was built. Fine quality instruments obviously receive more attention than models on the low end of the price spectrum, and as such have a better touch from the beginning, but even the finest quality piano will go out of regulation over time. 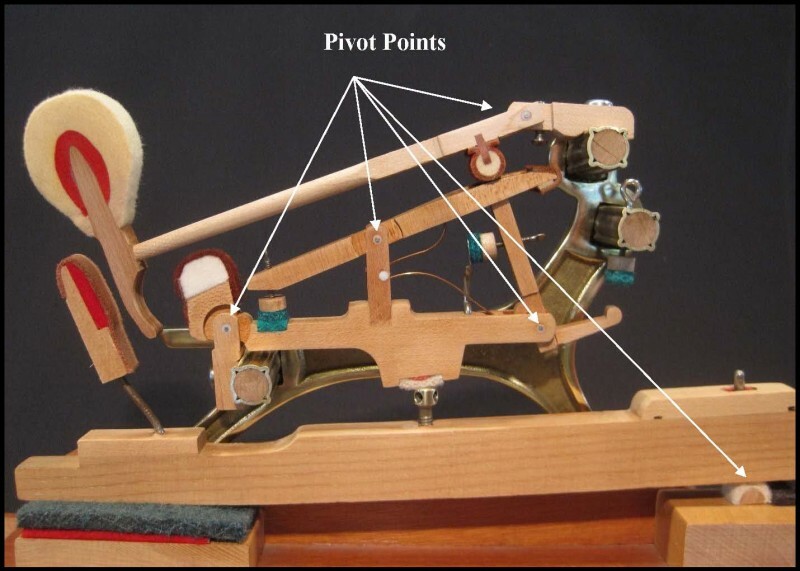 To understand the complexity of the grand piano action and the primary cause of an action going out of regulation, consider the cutaway photo of the working mechanism (action) of a grand piano on the next page. The action of a grand piano is truly a mechanical marvel. Even though it was perfected before the turn of the last century, its remarkable design is still in use today. Although the operation of a grand piano may seem simple from the outside, inside it is in fact highly complex. Just as an accomplished athlete can make a difficult skill “look easy,” the efficiency of the grand piano action makes a very complicated set of motions seem simple. In fact, it is anything but simple.When a note on your piano is played, the energy from your finger instantly puts a carefully balanced system of levers and springs into motion. Five pivot points simultaneously swing the combination of parts into action. Felt cushions at all contact points prevent action noise from intruding upon the music produced. The primary reason that the action of a grand piano goes out of regulation is that the felt parts (over two dozen per note) which are so important to its functioning become worn and compressed with age and use. 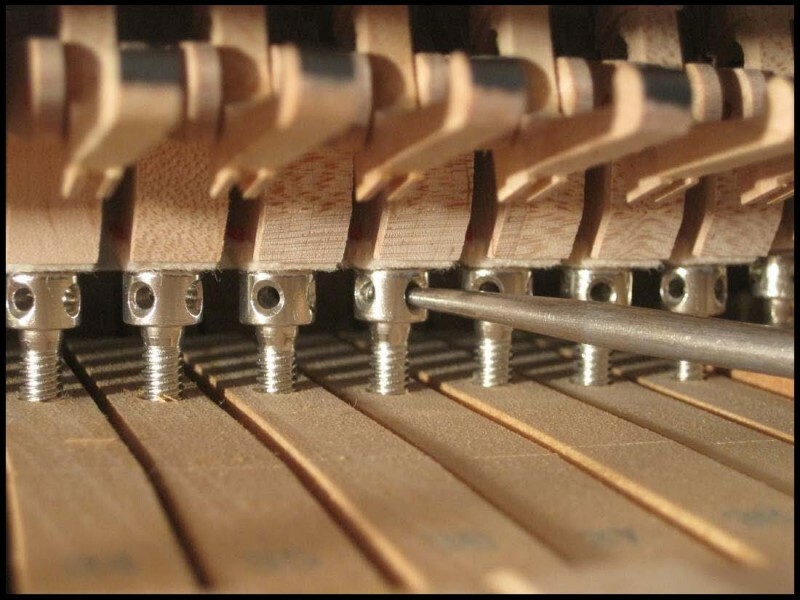 As this compression occurs, adjustments to the contact points which were made when the piano was new no longer are accurate. As this happens, a gradual loss of performance occurs. Lost motion in the action prevents maximum power from being transmitted from the keys to the strings when forte is called for. Early release of the hammers causes misfiring notes when subtle pianissimos are attempted. Doublestriking notes become an annoyance. Although the change occurs over time, at some point it starts to become obvious that the piano is not at peak performance. It’s highly recommended that all important repair work involving the action of your piano be completed before the instrument is regulated. That way, the work will result in the maximum benefit. One might compare regulating a piano to painting an automobile. If the body of a car had not been cared for in years and had taken a real beating it would make no sense whatsoever to take expensive paint and spray it over rust and dents without preparing the surface beforehand. All important body work would need to be done before the paint would be applied, otherwise both the labor and the paint would be pretty much wasted. 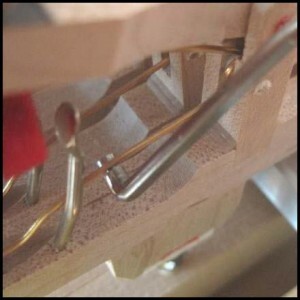 In a similar way, if a piano has not been maintained on a regular basis, it should be looked over carefully to determine what repairs are needed in preparation for regulating. Hammers may be badly worn and in need of replacement (see photo) or shaping. Action parts may need repairing or alignment. Key bushings might need to be replaced or resized. Any repair which would have an effect on the regulation process should be accomplished first, before the timeconsuming job of setting adjustments is made. Otherwise, a great deal of backtracking might be necessary down the road when adjustments which were made once are thrown off by new parts or repairs. Assuming I do decide have my piano regulated, what will the job involve? 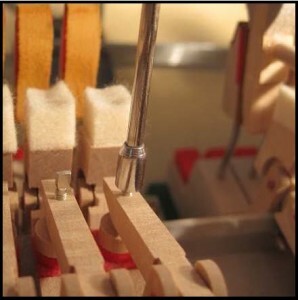 After the action of the piano is removed and important measurements are taken (string height being the most important), the action itself will most likely need to be transported to the workshop for servicing. Although it might be technically possible to do this work in the home, it ordinarily works out much better to complete a larger percentage of the work in the shop, where a bench is specifically dedicated to this exact type of servicing. Once in the shop, preliminary repairs and replacement issues may be dealt with before the actual job of regulation is begun. With the action in the workshop and on the bench and preliminary repair work done, the job of setting all important adjustments may be done with extreme precision. Each of the necessary settings is made for all eightyeight notes of the piano, then checked and rechecked. Since every adjustment affects other adjustments, the process is not a simple “once and done” procedure, but more a process of refining the mechanism by going through the complete series of steps a number of times until everything is at the optimum setting. Adjustment of capstans to raise or lower hammer height. Hammer height refers to the distance from the striking surface of the hammers to the underside of the strings. This is set at the optimum distance for the hammer to swing to achieve maximum power. Just as the amount of swing is important to a golfer when he hits the ball, too little or too much swing when a note is played on the piano is not desirable. Insertion of leveling papers to level keys. Keys should be perfectly level from one side of the keyboard to the other. 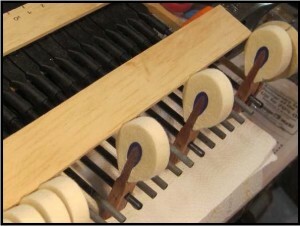 The keys rest on felt punchings, which sit on top of the balance rail. 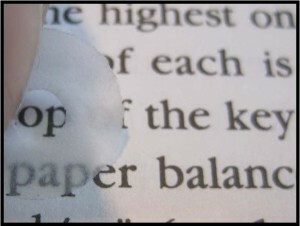 Leveling papers of differing thicknesses are then used to bring all the keys up to level. 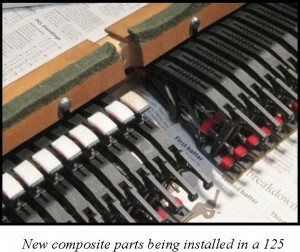 This is an exceedingly fine adjustment, with combinations of leveling papers used to create increments of .001″. Adjustment of letoff buttons. The letoff button releases the mechanism in its upward motion a splitsecond before the hammer reaches the strings. This way, the hammer is traveling under its own momentum when it hits the strings, and is not just shoved into them. 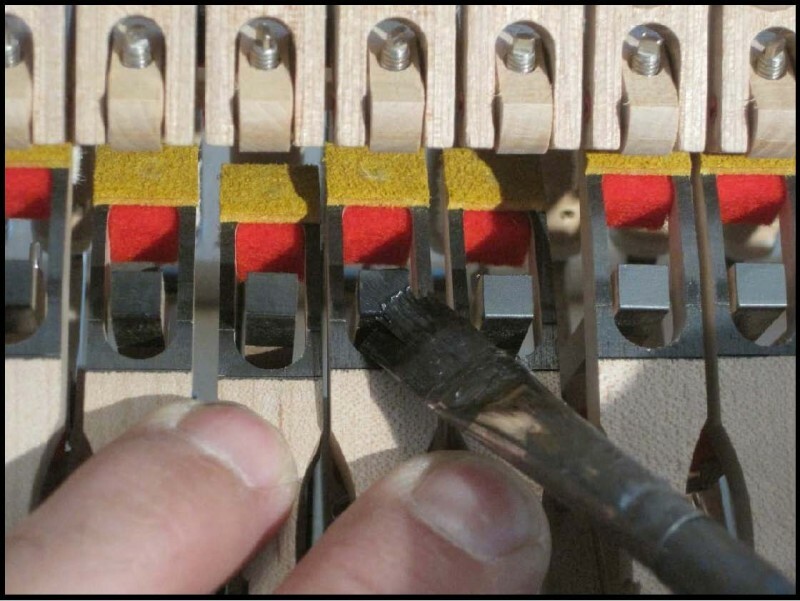 This adjustment is made such that the hammers release as close to the strings as possible so that when the pianist plays with an exceedingly light touch, the piano will respond. Adjustment of the repetition springs. Each note has a spring which helps the action to “reload” before the next note. This is done immediately after a note is played but before the key even has a chance to reach its rest position. The setting of this spring is critical, in that too much tension may cause double striking hammers, and too little tension will cause a very sluggish or even nonworking note. Setting the height of the repetition levers. This adjustment goes handinhand with that of the repetition springs. The repetition lever holds the hammer assembly in position so that the note is always ready to fire. It must be set eversoslightly higher than another part (the ‘jack’) that propels the hammer towards the string. This is so that once the note is played, the jack may slip quickly back into place. These are just a few examples of the steps which need to be done. Depending on the make and vintage of the instrument, up to 40 steps or more may be involved in the regulation of your piano. Getting all the various settings perfectly “in balance” with one another is a lengthy and very technically challenging process. Tolerances that are extremely close are standard. 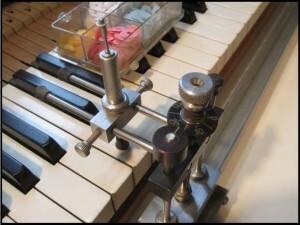 In the case of leveling the keys, for example, very fine leveling papers may be used (photo right). When this degree of precision is being pursued, it is understandable that the work can become quite timeconsuming. At this level of precision, time is also necessary to check and recheck adjustments. The initial runthrough of adjustments will get settings close. However, as more and more steps are completed, things gradually shift in position throughout the action, and by the time the first runthrough is completed, it is necessary to go back through for a finer round of adjustments. Two, three or even more rounds of adjustments may be necessary to bring the performance of the piano up to its potential. Are there other factors which may influence the amount of time needed to complete a regulation job? Yes. If the piano has not been serviced for decades, the time required to put the action back to factory specifications may be much longer than for a piano that has been maintained at regular intervals. Also, if the action is being rebuilt with entirely new parts, more time will be necessary. The rule of thumb is that the more new parts that are installed, the more time necessary for fitting and adjustments. How often does a piano need to be regulated? For everyday pianos, a regulation every 5 10 years should be adequate. Since a piano goes out of regulation as a result of the amount of play, a piano which is used on a more regular basis will need to be regulated more often than one that sits idle for long periods at a time. 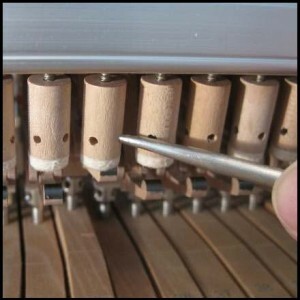 Other aspects of piano maintenance, such as tuning, need to be performed on a more regular basis. Friction points of a grand action being coated with an action lubricant.